Hi everyone, Steph Ackerman here with my third post as the guest designer for eP for the month of May. I found this wood board in my local store and thought it would be fun to work with. I wasn't sure at the time what I would be doing, but I knew it would come in handy. 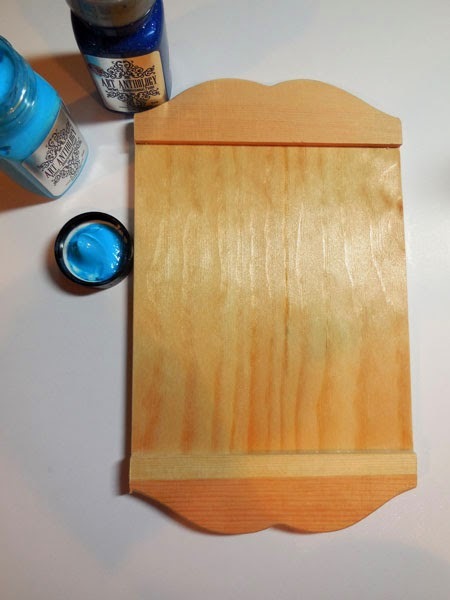 Today, I'd love to show you how I turned this plain board into a wall hanging. 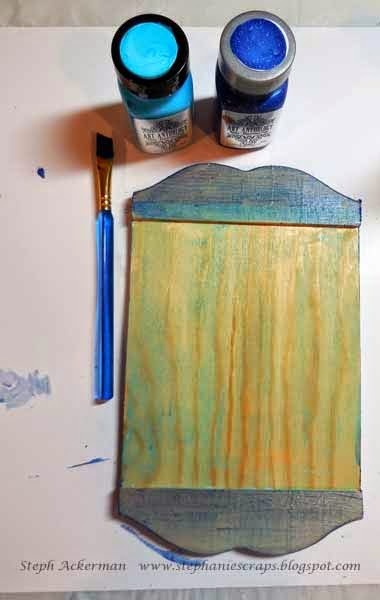 Using Art Anthology's Velvet Dimensional Paint in Aloha, I lightly painted the background. 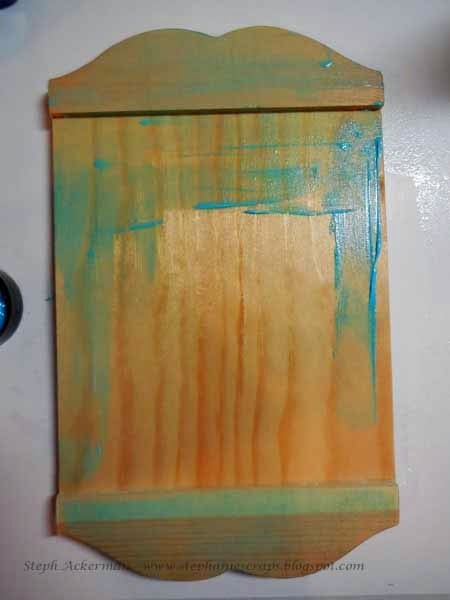 Since I wanted a hint of color, I spritzed the panel with water which allowed the paint to flow. Then I added in Art Anthology's Sorbet in Honolulu Blue for a bit more color. I also painted Art Anthology's Sorbet in Honolulu Blue on the edges for dimension. The papers I used are from October Afternoon's Travel Girl collection, which I thought would be perfect for what I had in mind. 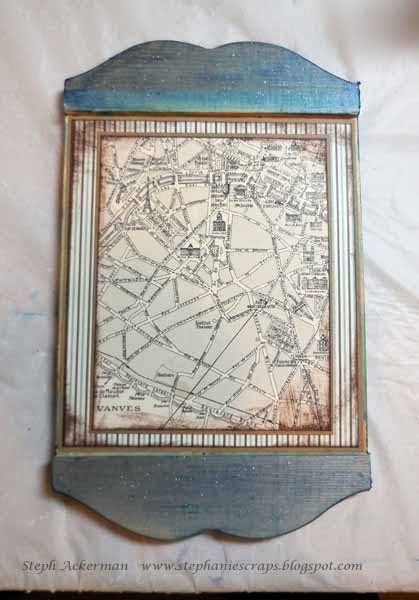 I cut the papers to fit the inside area on this plaque, inking the edges with Memento Rich Cocoa Ink and matting with cardstock before adhering. I cut and tore some wordy travel paper from this collection, matted with some cardstock and placed it so it appeared to be falling off the right edge. I added a large die cut oval from brown cardstock on top. Using a Stamping Bella stamp, I colored her with assorted Copic Markers and then fussy cut her, placing her atop the oval with pop dots for dimension. What a wonderful project altering this plain wall hanging Steph! 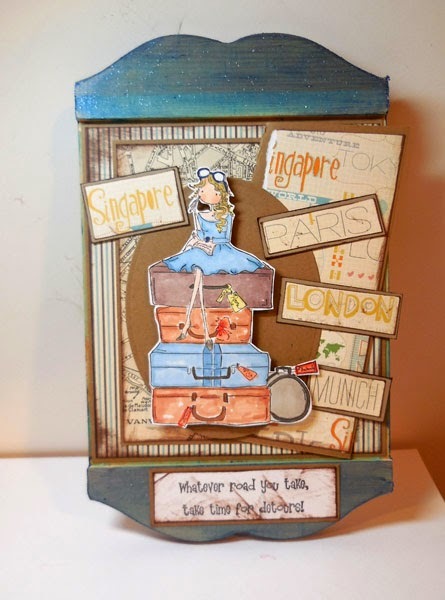 love the watery coloring on the wood - and the fun travel theme pieces! What a neat inspirational wall piece! Love the Bella atop the suitcases!! Love this Steph and your digi is so cute! Great Wall hanging, Steph! Especially love the colors and different wood grains! Ooohh I think I have one of those wooden thingies in my stash. Wonderful way to alter it and I love the images. Oh wow! What a neat project! I wish I had one to alter, because you have totally inspired me!